Now that summer is here, I don't have schoolwork but I still have plenty to do. But unless I am intentional about it, it is extremely easy to spend the whole day watching TV or reading a book. 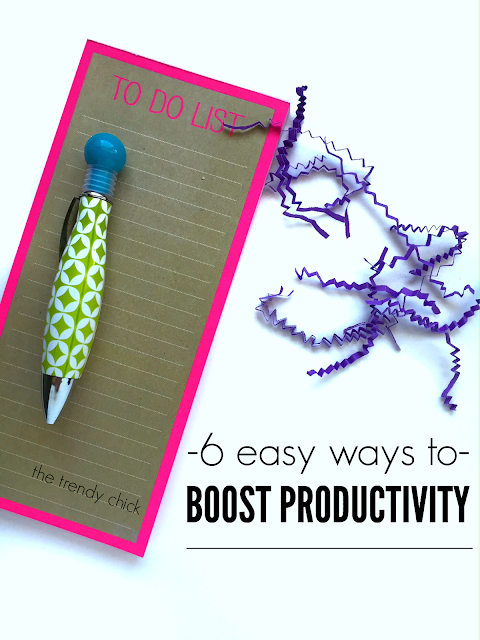 Today I am sharing 6 tips that I use to stay on track and boost productivity. Make a list the night before of everything you want to accomplish the next day. Then when you wake up in the morning, you can immediately start tackling the items on it. Nothing is more satisfying than crossing things off of a to do list! We all know how distracting social media and incoming texts can be. If I am working on something and want to be productive, I will turn my phone to airplane mode. An added bonus to this is that your phone will charge faster while in airplane mode! This is so important to do when you don't want to waste time. Time blocking is just focusing on one thing for a set amount of time. Reply to emails for an hour, then write posts. Or clean a room, then work on homework. Just focus on one thing at a time and don't go back and forth between two or three things. Lastly, it is important to stay hydrated. It helps you focus and you will just feel better overall. But if you have to get up every 15 or 20 minutes to get a drink, it can easily become a distraction. Try placing a water bottle wherever you are working so you can take a sip and get back to work!